Traditionally, B2B selling involves mostly outbound techniques such as trade shows and cold calling. Companies doing so are simply casting a wide net and hoping for the best. These outbound strategies often don’t generate a high ROI due to the sizable budget required to execute the tactics and the change in prospect behavior to block outreach attempts by any business. In order to increase your ROI, you need to focus time and resources on attracting high-quality leads that are most likely to convert and are researching solutions to the problems you address. Thankfully, with today’s marketing platforms and technologies, it’s possible for B2B vendors to attract high-quality prospects even with a small marketing team and a moderate budget. B2B buyers appreciate valuable information that helps them advance their careers or do their jobs better. By publishing highly relevant content, you establish credibility with the right decision-makers at the start of the buyer's journey to nurture relationships and convert them into customers. 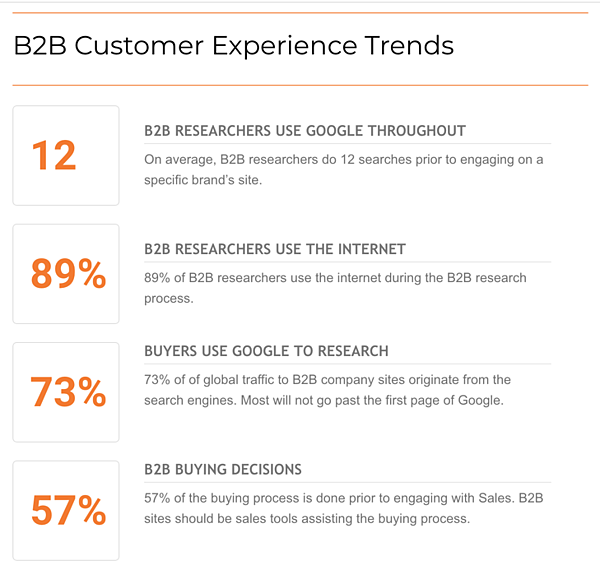 Most B2B audiences prefer educational and actionable long-form content. White papers with in-depth and industry-specific insights are great lead magnets for capturing leads. The following Pardot Infographic shows the content types at different stages of purchase intent. In addition, devise a content promotion strategy to reach as many prospects as possible so you can maximize the effectiveness of your content creation efforts. Content marketing is an integral and important component of the inbound marketing methodology, which focuses on driving quality traffic, capturing leads, nurturing relationships, and building advocacy. Since most B2B buyers research online before engaging with a vendor, you can attract high-quality leads to your website by using the right keyword and SEO strategies to get found in organic searches. To maximize your ROI, make sure you're driving traffic that's most likely to convert by understanding your buyer personas and mapping out customer lifecycle stages. Don't forget to set up lead capture mechanisms and calls-to-action (often called conversion-rate-optimization) on your website so you can convert traffic into leads. 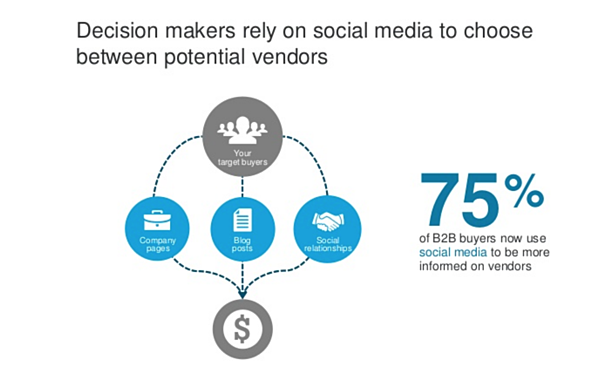 As more B2B buyers are using social media to help them with research and decision-making, it's important to establish a social media presence that'll help you attract high-quality leads. If you have a small team, it's best to focus your efforts on one or two platforms that your prospects use frequently so you don't stretch yourself too thin. 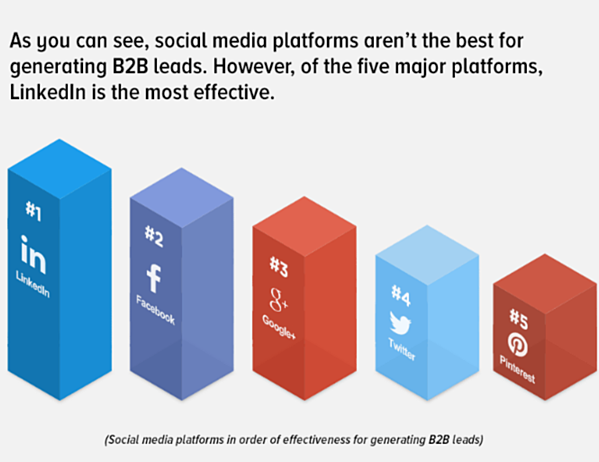 Many B2B vendors find LinkedIn to be the most effective platform. It has a professional focus and allows you to search for members and segment audience by company name, job title, location, expertise, and interest. Crafting a compelling profile that highlights your offering and expertise. Connecting with individual prospects and sharing your content or lead magnet. Positioning yourself as a subject matter expert in group discussions. Publishing on LinkedIn Pulse to establish thought leadership and increase the reach of your content. Using "sponsored post" (LinkedIn's paid ad) to target content to a specific audience. Getting reviews from your customers on third-party review sites (e.g., G2Crowd and TrustRadius) is a great way to attract high-quality leads. You will increase the chances of being seen by prospects who are looking for the exact kind of products or services that you offer. In addition, these sites tend to have high domain authorities. Getting listed and reviewed on them can help you get found in organic searches. Besides asking your customers to post reviews, you should monitor these sites regularly and respond to comments in a timely manner. This helps build trust and confidence when prospects see that you're committed to providing excellent customer service. Leads that are referred to you by happy customers are more likely to convert and buy more from you. By ensuring post-sale customer satisfaction, you'll be able to get high-quality leads through customer referrals. To build advocacy, you can offer exclusive content and provide outstanding customer support to your current customers. You can also encourage customers to tell their friends and colleagues about your products or services by setting up a referral program. Don't forget to ask! When you have one-to-one interactions with your customers, simply ask if they know anyone who can benefit from your products and if they could make an introduction. Of course, always thank your referral sources and make sure they feel appreciated so they'd send you more businesses. Adopting a customer-centric approach that delivers a relevant experience to your target audience is the key to attracting high-quality leads. You can reach prospects that are the right fit for your products by first understanding your buyer personas and then presenting the right information in the right place at the right time using tactics such as blogging, video marketing, SEO, social media marketing, demand generation campaigns, and more. Here at Bristol Strategy, we specialize in helping companies generate high-quality leads by creating synergy among all the different tactics to reach your ideal customers. Check out our range of services to see how we can help you grow your business.